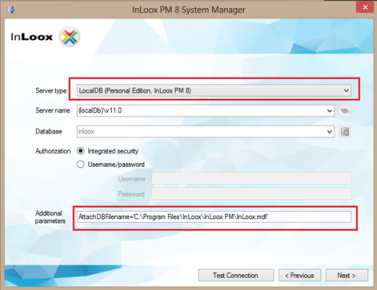 The InLoox Personal Plus edition allows you to install InLoox on two different devices. In order for you to access your project data from a second device, you need to copy the database files first. Copy the files inloox.mdf and inloox_log.ldf. 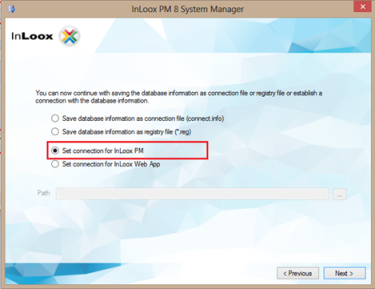 Paste the files to the InLoox PM installation directory on the target device. The database is now ready to be used on both devices. Copy the files inloox.mdf and inloox_log.ldf, and paste them to the directory you like. Replace the default path in Additional parameters with the directory of your choice. Click on Test Connection to test the database file path. If the test is successful, click on Next to continue. Select Set connection for InLoox PM. The connection has been successfully changed and InLoox PM is now ready to be used on both devices. Duplicate and install the project database | InLoox 9 for Outlook • Copyright 1999-2019 © InLoox, Inc. All rights reserved.